What does it really mean to be healed? Healing is a form transmutation or transformation; changing form. When you heal yourself, you transform yourself, transmuting that which does not serve you. You take ‘dis-ease’ and transform it into health. True healing is a lifetime endeavour, not a temporary fix. If you want to live a life of health and vitality it requires you to make a lifestyle commitment. You must think and act in a way that intends your highest good physically, mentally, emotionally and spiritually at all times. Treating the physical symptoms alone will not do. After all, any ‘dis-ease’ that has manifested physical symptoms has it’s origins in the emotional, mental and spiritual realms. In fact, the ‘dis-ease’ manifested on those levels first. If you self heal and/or heal others then you’re an Alchemist. You’re taking an illness that is symbolically and energetically dense like a stone (think Philosopher’s stone) and turning it into gold (or Light). 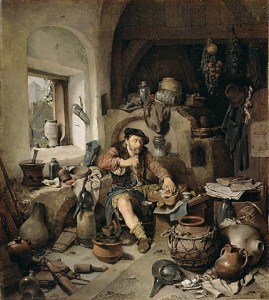 Consider the symbolism of Alchemy. An Alchemist is depicted hard at work in his (or her) laboratory as he (or she) goes about the ‘Great Work’. Emphasis here on the word ‘work’. Wouldn’t it be marvellous if we could simply be touched by a guru or take a magic potion and all of our woes would disappear? Some might think so, but the truth is, alchemy is hard work that requires lifelong commitment on a daily basis. The work doesn’t end until you re-unite with the Divine Source, and we all still have a long way to go. So, until we complete the work, we must constantly and consistently expend energy towards our spiritual goals. Every healing brings us that little bit closer to the purity that is Source. 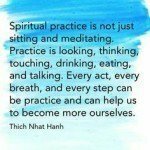 Meditation should absolutely be a part of your daily practice. Meditation helps you connect to your higher self and to Great Spirit, which is the origin of all healing. Deep breathing exercises balance your mind, body and soul making you a clear channel for Divine healing power. When you are channeling the energy of the Universe you can direct its flow with your intention to the parts of yourself that need healing. Pray – Prayer does not need to be associated with any particular religion, however there IS a reason why prayer is an integral part of all religious practices. Prayer opens the heart and prepares you for meditation. Make prayer a regular part of your daily routine. The best times to pray are when you wake up, when you retire for the night and before meditation. I repeat the Lord’s Prayer and a version of the same prayer that has been adapted to honor our Earth Mother. You don’t have to be Christian to benefit from repeating the Lord’s Prayer. I’m not. However I do acknowledge the mystical and alchemical power rooted in its words and sound, free of any dogma. Bless your food – You may think that praying before a meal is somewhat dogmatic, but you’ll find that this religious practice actually has it’s origins in alchemy. By giving thanks for your food you are channeling the energy of gratitude into it, and thus when you ingest the food that intention is taken into your body, blessing every cell. Here is an example of a non-secular prayer/blessing: “Thank you Great Spirit/Universe/God [whatever feels comfortable to you] for providing me with this food. May it bless my body, every cell, sending the message that ‘I’m sorry, please forgive, thank you, I love you’. I give thanks to all beings that have made this meal possible, and wish all beings to be happy, nourished and free. Amen”. You can also bless your food when preparing it with the use of sound. For example, when I’m preparing food or drink I chant ‘Peace’ three times over it. Three is the number that manifests in the material dimension (3rd dimension), and so it is said that repeating an intention three times manifests that intention into physical reality. The number three connects the body, soul and spirit. If you know the work of Dr. Emoto you will appreciate the power of sound and loving intention on the molecular structure of water. Pillar of Light meditation – This is particularly important if you are a practicing healer or therapist of any kind. Every day you will interact with the energy fields of others, some of which will inevitably drain your own energy field. Start your day by visualising a pillar of bright white light surrounding you. See that pillar of light centred in your heart centre, reaching right up to the Universal Source or Heart of God and right down into the Heart of Mother Earth, grounding you in both directions. This will protect you from negative entities in the astral realm. There are some people that believe protection is not needed; that it actually attracts the very entities you are asking to be protected from. This may or may not be true, but I can say from personal experience that I have found protection to be essential in my energy work. Violet Fire meditation – This is a powerful meditation for the transmutation of negative energy, including past karma. You can visualise violet light surrounding you and filling your aura and/or repeat the mantra ‘I AM a being of violet fire, I AM the purity God desires’. Create an altar or power place – Create a space in your house that is set aside as sacred. It may be a corner of your bedroom or a room in your house. Having a special place where you connect with the Divine intensifies your experience and intention during prayer and meditation. Walk in nature – Touch ground with bare feet every day. Hug a tree. You know the drill. 🙂 Building a relationship with elemental energies such as fairies and the green man are beneficial for keeping yourself grounded and supported in the density of the physical world. Cleanse your energy field regularly – A favoured technique of mine to cleanse my auric field is smudging with white sage. I also love using Copal, which is a resin popular in Mayan culture. If you don’t have white sage or copal you can also use myrrh, frankincense, lavender or juniper. Secondly, you can fill a spray bottle with blessed water and a touch of essential oils such as rose or lavender. The use of rose water is a favourite of mine for a cleansing spritz. By maintaining a spiritual practice not only will you support your healing, you’ll find gnosis; the direct experience of Divine Truth. I’ve provided a few suggestions here, but I’d love to learn what you practice on a daily or weekly basis to keep yourself a clean and clear channel? Your comments shared below are very much appreciated.